Senior Jubilee Robinson was named one of Bethesda Magazine's "Top Teens" for her tireless work in the Watkins Mill High School community. After being homeschooled from kindergarten to eighth grade, senior Jubilee “Lee” Robinson entered the halls of Watkins Mill High School on the first day of freshman year with her short and very bright pink hair, ready to take on any challenge that came her way. For the second year in a row, a Watkins Mill student has been named one of Bethesda Magazine’s “Top Teens.” Robinson was selected because of her hard work in the Watkins Mill community and her drive for change. Robinson is one of The Current’s Associate Editors, Editor-in-Chief of the Literary Magazine, drama tech captain, and president of the LGBTQ+ club. 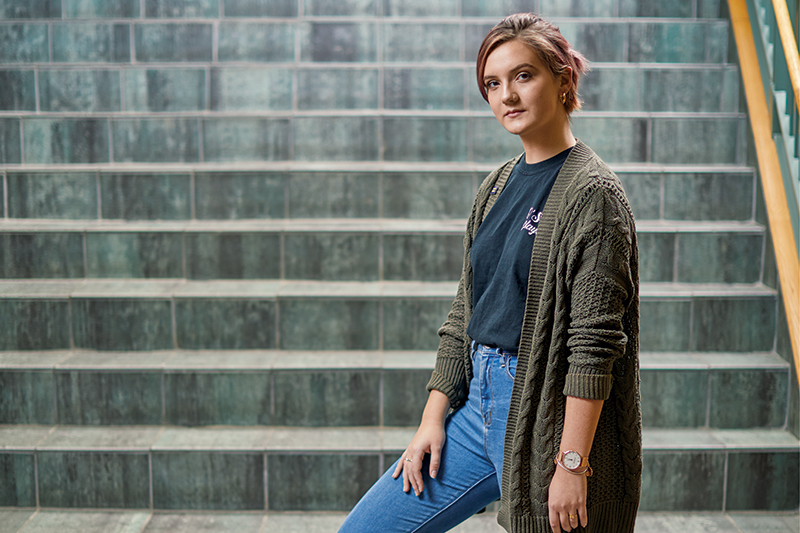 Robinson has been been pushing for change in the local community by bringing awareness to issues in the LGBTQ community and demanding change. Science resource teacher Matt Reese and English teachers Sara Confino and Scott Tarzwell nominated Robinson because of her tireless work in the school to help students feel comfortable with who they are, as well as creating a safe space for students at the Mill to feel welcome. Robinson has been writing for The Current since her freshman year of high school and has written and co-written many of the most-read articles on The Current’s website, including an editorial about MCPS reevaluating the names of schools due to the history of racism. For as long as anyone can remember, Robinson has been the biggest advocate for bringing awareness and educating people about the LGBTQ+ community. “She has been an active participant in helping get together a Pride parade float for MCPS,” Tarzwell said. “Lee has the remarkable ability to feel compassion for those impacted by the injustices she sees around her and the motivation to speak and act on their behalf,” Robinson’s mother Danyelle Robinson said. Robinson has two mothers (her dad transitioned when she was six) who are extremely proud of her. “She dreams big and works hard to accomplish her goals,” Danyelle Robinson said. Robinson’s work in the classroom and in the community has affected many students positively. “She is inspirational, she is strong-willed, and yet very approachable and funny,” Tarzwell said. Bethesda Magazine’s article featuring Robinson is on newsstands now.